As a leading online apologetics and discernment work, Apprising Ministries has been warning you about the teachings the Emerging Church icon Rob Bell, co-teaching pastor at Mars Hill Bible Church along with his good friend Shane Hipps. As I told you in Unrest With Rob Bell Inside Mars Hill Bible Church, there are many sincere believers there; my concern is while they are trying to follow Jesus, there seems to be something seriously going wrong within the leadership of MHBC. The more Bell’s book tour contines, for example on MSNBC below, the more Google searchers end up here and I’m being contacted by people within MHBC in their attempt to get more perspective concerning what Rob Bell advocates and teaches; not just in his new book, but his theology in general. I’ve also told you about an infestation of ne0-Gnostic corruption called Contemplative Spirituality/Mysticism (CSM), which is now pandemic within mainstream evangelicalism through its foolish embrace of the sinfully ecumenical neo-liberal cult of the Emergent Church aka the Emerging Church with its quasi-universalism in a new version of postmodern Progressive Christian theology under their spiritual circus “big tent” of empty Emergence Christianity. Some ask: “But do you really have to put it like that?” I’ll answer with the words of the late Dr. Walter Martin: If you have any brains you do. For you see, this isn’t a game; this is a spiritual war for the souls of men, and we only have one lifetime to reach them with the Gospel of Jesus Christ — And just as it is appointed for man to die once, and after that comes judgment (Hebrews 9:27). Jesus has given you years of straight ahead apologetics exposing the drifting of Rob Bell; when that didn’t work, He’s also sent polemists like me to tell it like it is in a more blunt fashion. And if you think I’m rough, wait until you see the next preachers God sends as this spiritual darkness decends upon apostatizing evangelicalism. You don’t like that kind of talk; well, as Martin used to say—and too many cult of celebrity preachers conveniently forget today—the Christian ministry is no place for personality contests. Please keep in mind that this isn’t simply about Rob Bell; I’ve said many times that he appears to be a very genuine and sincere man, however he’s sincerely very wrong about the nature of God. You need to remember, it’s not unloving to tell someone the truth; you can get in a lot of trouble doing it, but it’s not unloving. 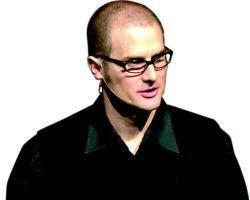 In the case of Rob Bell, the truth is he’s heavily involved in the practice of a form of neo-Gnosticism. If one doesn’t recognize here that Bell is praising “the mystics” for their supposedly superior spiritual understanding, which is but a reimagined Gnosticism, I personally believe it’s simply because they just do not wish to see. The fact is, in pieces like Rob Bell In A Nutshell: Contemplative Spirituality/Mysticism and Through Rob Bell “The Great Enlightened Ones” Tell Us Man Has Divine Greatness as well as Shane Hipps And Rob Bell Teaching Heresy, I’ve shown you that universalism is part of the fetid fruit of those who practice this spurious CSM, e.g. like Bell and the unholy EC trinity of apostates, Living Spiritual Teacher and EC guru Brian McLaren, universalist Emerging Church pastor Doug Pagitt, and his friend Tony Jones, the progressive “theologian in residence” at Solomon’s Porch. The Lord be praised, I was already warning you about this two years ago in Rob Bell And Christian Universalism. In closing this for now, to further edify the Body of Christ, below the video I’ll share some resources that will help you quickly cut through the mystic mythology of Rob Bell et al. COULD ROB BELL BE WRONG?